Homes for sale in Westridge are found surrounding the first bridge on the Skiway, walking distance to the Snowflake Run, and a quick slide down to Beaver Run. It’s just a 2-minute drive to central, downtown Breckenridge. Westridge is an infill neighborhood, built out from the 1990’s in concert with the adjoining subdivisions, which fit like a glove with this one. Two of these are also called Westridge – Westridge Townhomes and Westridge Cluster Homes. One by one, homebuilding is still ongoing in Westridge and a few lots are still vacant, but only a few. You can find current Westridge real estate listings below, or jump down to read more about this beautiful subdivision. All through Westridge there are trails to the ski area, and give access to recreation summer and winter. The skiway is maintained all winter and is an gentle route from the slopes higher up and down to the gondola in town. At the base of Peak 8, the ski resort offers family entertainment in the summer by running a coaster, and the Alpine Slide. The free town bus stops at the Snowflake Lift which is an easy walk from Westridge. The advantage to a Westridge home is that they are relatively newer, are generally large on lots that are much bigger than an in-town lot, but smaller than an estate. The neighborhood is new, and democratically composed of single family homes, townhomes and three cluster homes. The roads are modern and paved in this neighborhood on the ski hill side of the Blue River Valley, and the views will be toward the east side of valley, which is dominated by Baldy Mountain. Size: 3854 sq. ft. to 6986 sq. ft. 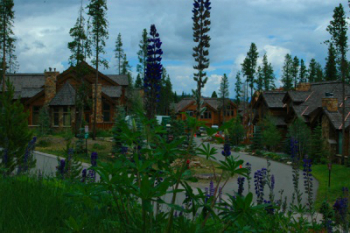 Amenities: on the skyway, or Snowflake run, and close to downtown Breckenridge. From the traffic circle on the north side of Breckenridge, continue on Highway 9 by proceeding on Park Avenue. After about 1 mile, past the stoplighted intersection at Ski Hill Road, turn right at the next street, which is Four O’clock Road. Take the next left on Kings Crown Road, and then the first right on Snowflake Drive and just past Westridge Drive you’ll find Westridge single-family homes. Curious about Westridge? We'd be happy to show you around! Contact us today to speak with one of the experts from Breckenridge Associates.